This is a commissioned post in collaboration with White Stuff. This Christmas, I am collaborating with White Stuff to create some blog and video tutorials for unique Christmas decorations using White Stuff fabrics. 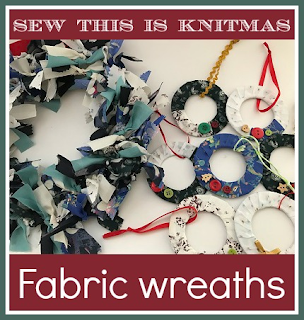 I have been sent some gorgeous fabric to use in my crafting, and I'm going to be sharing the instructions for two different Christmas wreath crafts. You can see more crafting inspiration over at Sew This is Knitmas. You'll find a full tutorial for both crafts in my video, and written instructions follow below. First cut out all your strips of fabric. Aim for a variety of different colours, patterns and textures. One a time, wrap each strip around the wire wreath base. Pull the knots tightly, and keep the front side of the wreath facing you at all times so that you can make sure all the wire base is covered and the fabric is tied in front of it. Push the knotted pieces of fabric close together as you go around, and make sure to add plenty of fabric strips so that the wreath is nice and padded out. Add a long length of ribbon to the wreath for hanging, then hang up proudly on your door! Make sure to fluff out the fabric strips so that it looks even all the way around. 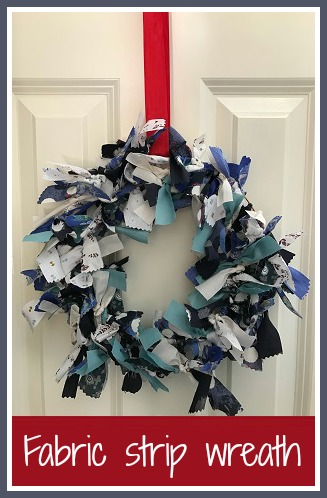 This style of wreath is a great way to show off a collection of fabric in different colours and textures - you could opt for colours that tone together as I have, or go for contrasting colours that really stand out. Cut your thick cardboard into small wreath shapes. I used large and small plastic beakers as a template, then I cut out the wreaths with scissors and a craft knife for the inside circle. Take a strip of fabric and wrap it around the wreath so that it is completely covered. Secure the end of the strip firmly to the back of the wreath with a glue gun. You can stick to one fabric or use several different ones for different sections of the wreath. 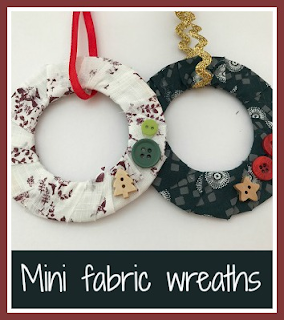 Glue embellishments, for example Christmas buttons, to the front of the wreath with a glue gun, and finish it off by tying some ribbon around for hanging. You can make a variety of different wreaths in all colours and designs, and you could also vary the sizes for a bit more interest. 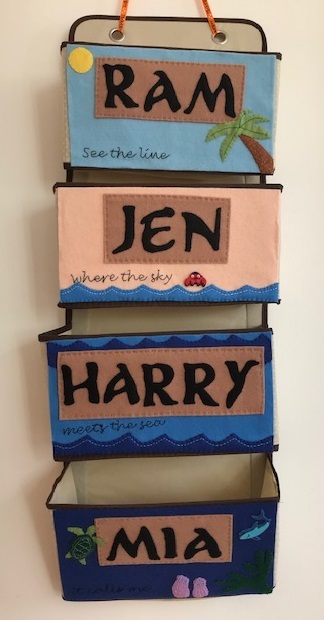 They are perfect for the Christmas tree, and they would also make a lovely gift popped inside a Christmas card. These are such great ideas. I think I may have some fabric spare too. Love all these ideas, have Pinned for later! The large one is fab! Such an effective style!